Woakes throws his hands up in frustration as Dilshan launches his hands at the ball, aiming an expansive drive over the top, the ball going straight through the opener but bypassing the stumps. The seamer drags the next ball down and Dilshan doesn’t miss out, pulling well in front of square. 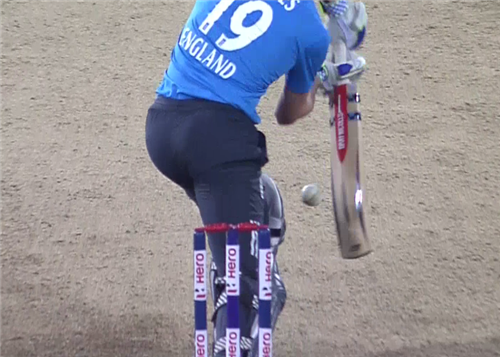 Woakes and Dilshan almost collide again but more pain is narrowly avoided as the openers scurry a leg-side two. [davidlloyd] I can’t see a thing here. It’s so foggy through this steamy window. Who sang Steamy Windows? It was Tina Turner." Perera, like a surfer riding a wave, gets up and over a short delivery to earn a couple and then beats Bopara’s shy at the non-striker’s end to add a single. Gurney remains guilty of bowling too short and Dilshan dishes out more treatment, a swivel pull yielding four more. The sloppiness continues with a wide and suddenly Sri Lanka’s start is beginning to look quite imposing. The average score for the team batting first at Colombo is 230, by the way. Perera happy to tick over with singles while his partner goes on the offensive – although Dilshan is certainly getting full value for his inside edge, picking up a leg-side single this time. A confident start, this is, by Sri Lanka and no mistake. England, who at one stage looked like conceding well over 300, are right back in this but they must keep their discipline – Woakes sending down the 15th wide of the innings. Mendis gets off the mark in imperious fashion, pulling his second ball just in front of square leg giving Moeen Ali – stationed just behind square – no chance. Woakes, who has one over left in the locker, now has figures of 2-47. As Beefy said, England are clawing their way back into contention. Can they keep Sri Lanka below the magic 300 mark? Thirimanne produces arguably the shot of the innings so far, coming down the pitch to Moeen Ali and going inside-out over cover, the ball dipping just before the rope and bouncing once before crossing it. Cook fumbles at fine leg to send the crowd delirious, the batsmen sneaking through for a single off the final ball of the over. Moeen Ali finishes with 1-66 off his 10 overs. Gurney has two overs left – enough to have the responsibility of bowling the last over and, on the evidence of the first five balls of this over which cost five runs, why not? Well, the sixth is a full bunger on leg stump that is meat and ddrink to Thirimanne, who swats it for four with disdain. No side has successfully chased more than India's 288/5 in 49.4 overs at the R Premadasa Stadium, Colombo in July 2012. Mendis gives Woakes’ first ball exactly what it deserves, pumping a drag-down delivery way back into the stands behind square for six. The batsman steps to leg to give himself room for the next and consequently can barely reach it, but gets enough bat on it to earn an off-side single. So it’s over to Thirimanne, who swats a slower-ball bouncer for one, returning the strike to Mendis who brings up Sri Lanka’s 300 with a sweet drive down the ground for four. The sixth fifty of the innings has come up in 36 balls – the same as the fifth. Mendis follows up by swatting Woakes’ slower ball straight for six. Mendis picks up another couple off the final ball after a Woakes wide. That’s 21 off the over. No side has ever chased over 300 to win an ODI in Sri Lanka. Mmm. So England will need 318 to win. Gurney starts the final over with a yorker that Thirimanne digs out for two. This innings would be long over but for England’s wide tally, which Gurney takes to 17. “It’s time to get back to basics,” says Beefy, rather gloomily as if he might have said it before. Mendis decides it’s time for a new piece of timber and what a lump it looks but he can’t wield it to its full force before the innings closes, Thirimanne squeezing out a Yorker for one off the final ball. Cook amasses three runs to bring Moeen, whose usurping of Alex Hales seems justified at this point, back onto strike. Two blazing boundaries – and two cheeky edges to the fence – lift the elegant opener into the 40s. Alex who? Oh yeah, England's 50 is up, too. [wicket] The skipper’s luck runs out. 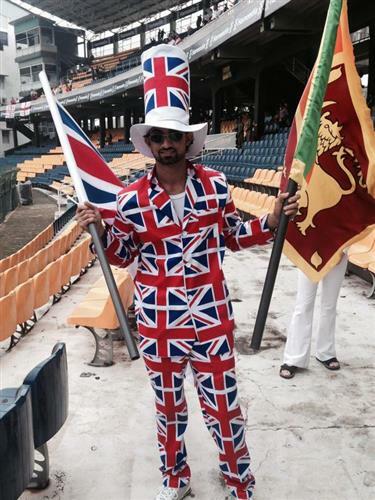 He is caught plum on the leg by the part-time spin of Dilshan as England lose their first wicket. That’s a blow - but an experienced head replaces Cook in the shape of Ian Bell. It’s The Moeen Show at the moment, however. The opener’s brisk innings gets brisker with a ninth four of this extremely watchable knock. Bell gets in on the act, going aerial to post his first boundary, and whipping down to third man for another few runs off Ajantha Mendis’ maiden over of the match. It’s all Midlands in the middle with Coventry-born Bell and Birmingham-raised Moeen. Rangana Herath hits Bell’s pads but there’s no danger for the England batsman with the ball clearly sliding by. Bell gloves one over Sangakkara next up, before his smooth whack into the covers is stopped by a diving Dilshan. Moeen does find the ropes, though, to bring up his 50 in double-quick time. Mendis continues to wheel away. Good work in the deep restricts Bopara to a single down the ground off the first ball so it’s a case of ‘over to you’ Mr Woakes, who gets off the mark second ball in similar fashion. Midwicket stands no chance as Bopara sweeps low and hard throw midwicket for four – the first boundary for 20 balls and 14 minutes. Mendis sends down another short ball but this time Bopara misses out, picking out the fielder on the rope, and Woakes can do no better as Mendis ends the over with a woefully short ball. Bopara hasn't given up the ghost - even though England's latest 50 is also their slowest of the match, coming off 60 balls. T Perera returns and opens up with a rare short ball at Woakes that he shovels to leg for a single. Bopara ticks over with a single before the seamer, getting the ball to jag back, he gets one through the all-rounder’s defences but can’t find the top of off. Perera tries his luck again with the short ball and it’s out again as Woakes top-edges over a leaping Sangakkara for four and a welcome wide helps the tally. Terrific delivery from Herath that pitches around leg-stump and turns and bounces gives Woakes no chance. He’s dragged out of his crease and Sangakkara whips off the bails. That was a wonderful piece of bowling from Herath – the ball actually pitched outside leg and turned past the outside edge. It was a terrific take from Sangakkara too. Bopara steps to leg and goes up and over cover for four to finish the over and show he’s not done yet. England need 54 off 42 balls. Ian Ward thinks Kumar Sangakkara will be getting praise from a fellow gloveman following his spectacular stumping of Chris Woakes. Matt Prior is back in our studio in London and I'm sure he'll have plenty to say on that. Any keeper would be very proud of that dismissal."